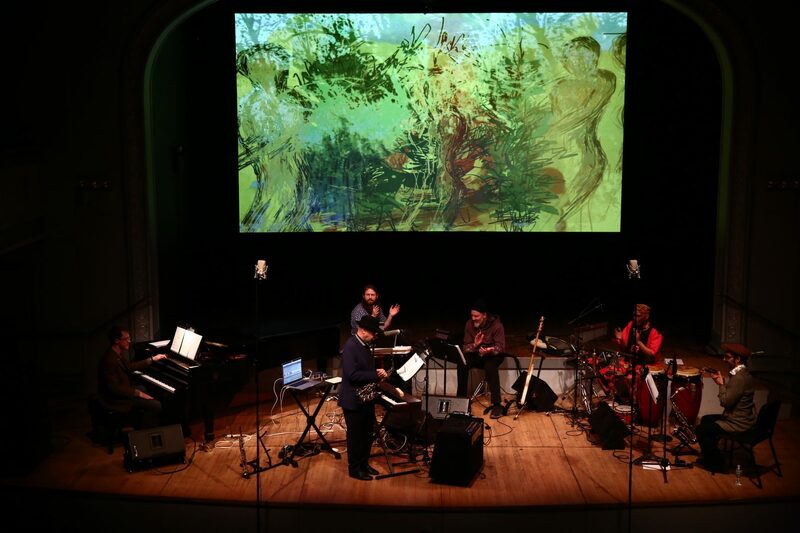 Kit Fitzgerald and Peter Gordon perform Into the Hot, Out of the Cool, featuring large-scale video paintings by Fitzgerald and a six-piece musical ensemble directed by Gordon, at Roulette on April 22, 2018 [tickets available here]. Below is a transcript of a conversation between this pioneering duo and Charles Eppley. This interview has been edited for clarity and readability. Charles Eppley: Would you describe your individual and collaborative artistic practices? What will you be doing Roulette? Peter Gordon: I’m a composer. I make music. I perform music. I play saxophone, synthesizer, other keyboards, and winds. I also work with electronics and digital recording media. My work encompasses instrumental works and large groups, such as the last time I performed at Roulette with ten musicians [in my ensemble] the Love of Life Orchestra. When Kit and I work together, [we perform with] a large screen and video projection, which I regard as part of the ensemble. My music goes between through-composed notation and various ranges of improvisation, as well as working with electronic processing in the studio. works and live video performance. The single channel works range from something with a musical track — some sort of music video — or any number of works that use [various] personas, factors, or abstractions. It’s a wide visual spectrum. In my performances, I work with pre-composed and mixed materials, which [encompass] live drawings, animations, and [lens-based] camera material. As part of the [musical] ensemble, I use a process of live performance through the ‘cool medium’ of video technology. I see myself as a part of the ensemble, performing live video. CE: The phrase ‘cool medium’ here is a reference to [media theorist] Marshall McLuhan and his distinction between ‘cool’ media that engage multiple senses, such as television, and ‘hot’ media’ that engage a single sense, such as radio? KF: Indeed… the live drawing, the touch of the hand, the warmth of a human intimate expression. I perform with the ‘cool medium’ of video technology itself. CE: Your projections are not pre-recorded, staged, or used as a background [for the ensemble to perform over], which is to say conceived of as less than the live music. In this dynamic, the projections function as a direct component of the total ensemble? PG: Yes. Things have changed since when we first started doing this in the 1980s. Video projection was not as ubiquitous then as it is today. You now see that projections are very often a second-thought in a performance: an ambience, a decoration, or a set of colors, slides, some sort of banner. When Kit and I work together, the projection is front-and-center in the context of a musical ensemble, where instrumentalists come to the front and take different roles. The overall fabric [of our collaboration] has the video projection functioning in this way. At some points, the projection could be in the background, it might be dark, or it might be really front-and-center. KF: The musicians can also see and respond to the projection. The video is a live component as important as any other instrument. KF: Yes. We want one full visual expression. The title of the new piece is Into the Hot, Out of the Cool, which describes a journey through different artistic areas and expressions. In terms of the visuals, we are working with pre-recorded camera imagery that will be key components, perhaps separate chapters, and a whole new series of drawings, which I think is a key part of what I bring to the projection. I see the video projection, whether I am working with paint, or live or pre-recorded camera imagery. It is a canvas. PG: Working within that canvas, I find that we work modularly within certain shorter pieces that become assembled more as a suite. So, at times, certain things take the fore. Musically, I see it less about the ensemble per se, and more about solos and duos and smaller configurations of instrumentalists working with the image. Sometimes they are directly synced up with what is happening on the screen, while other times there might be a, how can I say, a stepping out of the space… there might be fragments of narrative storytelling that speak with the audience. I think that the overall [piece] will have that intimate quality derived from what Kit is doing, and what I am doing, and how it all interacts to open up different windows, and reveal other perspectives. CE: What is the instrumentation? What are some of the narrative themes at play? PG: Part of the storytelling is about coincidence and biographical coexistence. The story has a spiralesque structure that might start out with a general story. For example, I may talk about a room where I once had piano lessons [as a child], but [the room] also happened to be in the house of a future supreme court justice. [The piece might] talk about connections between music and politics. With each time a spiral story might end up sort of a, well, I won’t say a poignant comment, but a directed comment that has a larger socio-political impact than expected, as it starts out as a casual and random story. KF: That realm of storytelling will also be encompassed in the video. I have footage with storytellers and, you know, it has a very modular structure. CE: You began to work together in the early 1980s. How did you first meet? How did you start collaborating? KF: Well, [among our first collaborations] was Return of the Animals (1984) at Rivoli Castle in Turin, Italy. It was a Love of Life Orchestra [work] with live animals. I was projecting visuals. This was early. We were in the hills of Italy and I used the castle wall as my projection surface. It was spectacular, but for me it was missing an ability to perform, you know, as part of the ensemble. I [had recently become] a sponsored artist by the Fairlight [digital audio company], which created their Computer Video Instrument (CVI). It was a live analog processor with a paint box… the perfect instrument for me, so we began doing performances together. PG: We first began doing gigs with the Love of Life Orchestra in 1977. We had on either side of the stage a black and white television set because Ernie Brooks, our bass player, did not want to miss the NBA finals or something. We had to play the ballgame in an art space. We incorporated it into the set. When we worked with John Sanborn, we placed monitors around the stage, which was kind of cool. They were the same size as a person, except glowing. So, we had multiple monitors, but we needed to go with a large singular image. Some of it came out of club culture: playing in clubs, making records that were played in clubs. For example, Kit was involved with the early Danceteria video lounge. When you’re in a club, the whole experience surrounds you, and there are speakers all around. We were interested in working with that [sort of] cinematic, big-screen experience, which is all encompassing. KF: We will work with just a single screen at Roulette. CE: How do you feel that your practices overlapped with the introduction and institutionalization of video art in gallery and museum spaces during the 1980s. The white cube is quite different than the club and black box theater. Did you see yourselves in that narrative? KF: There was no separation. My work was being shown at MoMA. It was happening at many places: museums, galleries, clubs, performance venues. Some spaces perhaps showed it better than others, but there was no opposition, no either/or. I had video installations at the Whitney and at the Kitchen. We were doing everything in every conceivable space. CE: – used video technology as a means through which to get to some other thing, or a broader concept, while not totally engaging with the medium? PG: Yes. The actual material itself was, how can I say, subservient to some process that it was meant to illustrate. In contrast, Kit’s work really embraces and moves forward with all of the possibilities of video technology as an instrument, [showing how it] can be learned and mastered [like other mediums]. Similarly, music functions as a conceptual element, but it is also something that you can have in your life and hang back with. There is a spectrum of experiences. Some things are intellectual. Others, if you hit that sweet spot, can be really fulfilling. There is a certain element of video art that does not sustain the soul in that way. You would not want to put it on unless you found out new things about your life each time you [experienced] it. We have these personal choices in music. We connect to some pieces [more than others]. You go back to it. It could be a guilty pleasure, or a great work. At the time that Kit and I began to work together, I was doing a lot of work with [the composer] Robert Ashley and his experiments in video opera. I think Bob was trying to reach that type of [impactful] experience. Maybe we are just talking about the sensuality of the medium? I think Kit’s work is interesting on many levels because it has a sensual quality. KF: Indeed. That’s the connection to painting. Painting has that sensuality. What does painting have in that regard that video does not? A kind of sensuality and repeat engagement? You can come back to video and it says something else to you, or you find something else in it. That is the nature, or aspiration, of the video works that I make. PG: Where does the aura of this, whatever this electronic or reproductive art is, exist? How do we maintain it or bring [forth] these sensual qualities? What is the sociological function of art in relation to our current technologies and tools? It’s not always obvious. I know that I have taken things for granted, musically or conceptually, and had to let go of certain attachments. I realize that things work differently now. Things are put together and perceived differently. As artists, these are some of the issues at which we are grasping. CE: This paradigm of sensuality, as you describe it, has been fairly well established in terms of sound and music. People mostly understand what one means by the sensuality of music. But with video, people might find it more difficult to understand how this could ever be a sensual medium. A core aspect of Kit’s practice is to explore and challenge that dynamic. Could you describe how the vast range of materials and technologies employed in your moving image works, comprising film, video, and animation, address this issue of sensuality? KF: I have always thought that the television image had a great possibility of beauty, but it was never performed at that level. The video image is a wonderous, gorgeous image. Part of what I do is seek beauty in that [televisual] medium, whether that is with a camera, which is of course understood through its filmic or cinematographic quality, or through the use of color, shape, and form in the [live video] paintings that I create. It is always an exploration of that form and an attempt to realize a potential of the exquisite beauty of what is, by standard, a rectangular image. I was instantly attracted to it once I was handed a video camera. I had done filmmaking, photography, and painting, but it seemed to me that video was like a watercolor at thirty frames-per-second. I have always seen the fluidity of the image. CE: You mentioned TV Lab earlier in the conversation. Some of the early televisual experiments in video art, such as the National Center for Experiments in Television (NCET), were supported by public television networks. In this context, broadcasted video art arguably operated in a sort of public sphere, and perhaps constituted a unique type of mediated public art. What was your experience at the TV Lab in relation to this broader socio-political context of the public TV audience? KF: The TV Lab at Channel 13 (WNET) was a key place [for video art]. Basically, it supported the work of artists such as Paik, William Wegman, Shirley Clark, Stan Van Der Beek, Bill Viola, John Sanborn, and myself. Money from the Rockefeller Foundation [and the New York State Council on the Arts] supported this one editing area at the station, and we had our own studio. Before I came into New York City, there was a studio over on 46th street near the United Nations building, which was a blue screen studio that had a whole control room with a Paik-Abe Video Synthesizer, a Rutt/Etra Video Synthesizer, and the best engineer, John Godfrey, who helped engineer works by video artists. We were seeking to come up with the new language of television. Eventually, that studio closed in the late 1970s and the work was then done in the Channel 13 headquarters near Columbus Circle, but we still had our own edit rooms. As new technologies came through — like a digital effects box or the sort — it would be acquired for the artists’ use. We had the newest technologies to work with and to find out: what is the language of the medium of video and television? It was grant-based, you had to apply and be accepted, and your work was broadcast [to channel subscribers]. We worked within the context of television to support and create our art on a regular basis. CE: The work at TV Lab was received by many people beyond the art world. KF: So many people. We had so much support. By that point, cameras were light enough and I was going out into the field to shoot on location. I’d come back [to Channel 13] and edit major artworks. Paik also did a huge volume of work. We were supported in taking our work around the world and presenting it elsewhere under the auspices of the TV Lab program. It was an opportunity to gain access, resources, and distribution within a larger television environment. It was a way for artists’ video to be presented on television. There was also an aspect of bringing art to a television audience. I directed many different documentaries on art and artists. For example, I produced and directed a documentary on Kenneth Anger and another documentary on avant-garde film. The TV Lab was a very vital place [for video art], and key to the development of my artwork at a time when I had just arrived in New York. CE: You mentioned the camera image, which refers to an exterior image that has been captured and electronified within the video apparatus, stored via tape or whatever storage medium. You also use animation and video processing, which is totally internal. With video feedback, you don’t need a lens-based image. Do you differentiate between such processes in your video practice? KF: I do differentiate because they are different ways of creating. You may not be on location or working with a camera, but a camera is to me a tool in the way that a stylus is to a tablet when I’m drawing. The camera is an extension of my body, not a foreign object. It’s a whole dance, you know, between the lens and the camera and myself. I don’t see the lens as a production element, but a tool, like a paintbrush is to a painter. My work is writing the language of the medium, as I imagine it is for whatever medium [in which other artists work]. When I was an artist-in-residence at the TV Lab, we were [tasked with] creating a new language for television. That’s the work that I continue to do in my studio. I see the medium as very physical. Maybe that’s part of what we were talking about before, whether in a museum or gallery installation versus a club or performance space. It’s a really physical medium, captivatingly so, and full of subtle innuendo. CE: What do you look forward to when working with Roulette and what do they provide to your work? PG: Roulette is a great space. Things look and sound good and there has always been a certain openness to new music and experiences. I first performed at Roulette in the early 1980s, when it was still on West Broadway. KF: In fact, I recently participated in a Culture Hub event at La Mama in recognition of the work of Bill Etra, who co-designed the Rutt/Etra Video Synthesizer. [The event] was coordinated by Benton Bainbridge, who spoke about having seen me perform my piece, Not In Here With That Thing You Don’t (1990), at the 4th Annual Festival of Women Improvisers at Roulette [on March 8, 1990]. I think that was my first live video performance at Roulette. The space was fantastic and encouraging. PG: Roulette is an important part of the art and music community in New York. It is a place where you can go and experiment and try different things. I have heard all sorts of different music and performances at Roulette. Some I’ve loved, some I’ve hated. It’s all okay. CE: Roulette is a meeting ground for lots of different disciplines. CE: Can you talk more about [your involvement in the] Festival of Women Improvisers? CE: Peter, you worked worked with Robert Ashley on his now infamous television opera Perfect Lives (1983), and also released a solo album, Star Jaws (1978), on Mimi Johnson’s record label, Lovely Music. How did you get involved with Johnson and Ashley? PG: I was a graduate student in 1973 at UC San Diego. Ashley came down to perform one of his operas. I was struck by his way of working and talking about music. I transferred up to Mills College, where I was a student at the Center for Contemporary Music. Ashley and Terry Riley were [teaching] there. It was amazing. When we moved to New York around the same time in 1975, I did some work for Ashley on Music with Roots in the Aether (1975) as a recordist. When he began to put together Perfect Lives, he also asked me to produce the electronic orchestra. That really gave me a [great] opportunity. I cut my teeth in the recording studio. I worked in a twenty-four track analog studio and was given free reign to experiment. I was able to treat this professional recording studio as an extension of a modular synthesis studio. I worked with Bob on that and, more recently, when Alex Waterman began putting together the newest Spanish version, Vidas Perfectas (2011-2014), he asked me to create a new electronic score that revisited Bob’s music within a new technological context. It was a very special opportunity. CE: I saw a filming of Vidas Perfectas at the Whitney Museum [during the 2014 Biennial]. They only let about twenty people in per session and you were sitting behind the cameras. You could see the stage director queuing Camera 1 and Camera 2. You see them move around and it gave me a new perspective on Ashley’s work, the mechanics of television, and videography as an artistic practice. In the context of your collaborative work with Kit, these are similar video experimentations for thinking of a new language for television. KF: Yeah. Victoria Keddie and Scott Kiernan of E.S.P. TV put it out front in that small space at the Whitney. Peter was also doing a live mix. PG: Yeah. The only difference is that you get less of a sense of the difference between film and television today. Traditionally, film was shot pretty much with a single camera and assembled linearly in the editing studio. For television production, especially in early live TV, you would have multiple cameras, which would be switched live. You would have a live performative element and a live audience. There is a different texture to cathode ray tubes as opposed to film projections. It’s hard to describe verbally, but there is a choreography, or a rhythm, that happens with live television. KF: There is a physicality to the medium of video and television that you do not get with film. You feel them differently. PG: Yes. There is a physicality. Charles Eppley works as a freelance arts writer and is Curator and Managing Editor at AVANT.org. His writings appear in Art in America, Rhizome, Hyperallergic, Digital America, AVANT, Surround Journal and Swingset Magazine. Charles has taught courses in art history, music, and media studies at The New School, Pratt Institute, and Stony Brook University. Brooklyn, NY – Roulette kicks off its Winter 2018 season with long-standing collaborative duo Peter Gordon (keyboard, sax, electronics) and Kit Fitzgerald (video) presenting Into the Hot, Out of the Cool. The performance will feature large-scale video paintings by Fitzgerald accompanied by a six-piece musical ensemble directed by Gordon. Fitzgerald’s visual imagery will include video drawings, animations, and camera imagery—mixed and processed live—combining early analog and current digital technology. The dialogue between the early and the contemporary video aesthetic is part of Fitzgerald’s signature look and is at the heart of the Hot/Cool dialogue. Into the Hot, Out of the Cool is a new work that marks the 35th year of collaboration between Kit Fitzgerald and Peter Gordon, a pioneering duo incorporating live video and musical performance. Fitzgerald and Gordon have presented their work at Brooklyn Academy of Music Next Wave Festival, The Kitchen, La Mama, as well as internationally.